If you are left with a lot of green tomatoes at the end of the growing season, when the first frost comes you have a wonderful opportunity to preserve those tomatoes by making a tomato pickle using a boiling vinegar brine. A few quarts of crispy, tart green tomato pickles will be cheer up meals in the dark of winter. Use mild or hot chilies in these pickles, depending on your taste. Buy pickling spice mixtures in the grocery store. 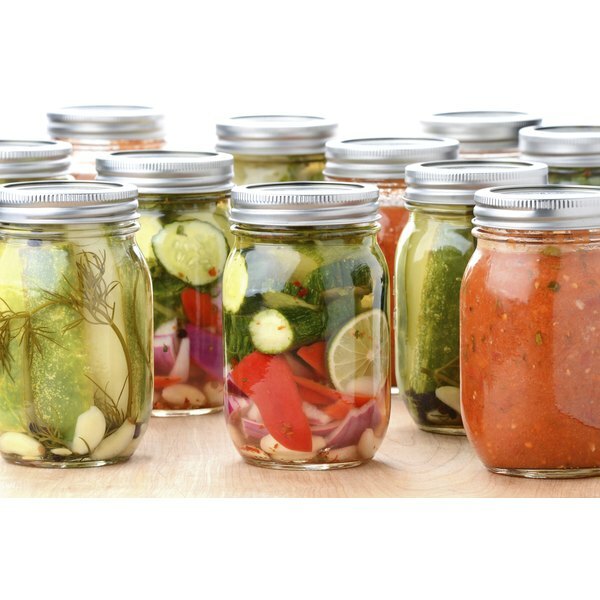 You can re-use canning jars and rings, but always use new lids. Fill the water bath canner half full with water. Bring the water to a simmer. Wash the jars and lids in hot soapy water. Rinse thoroughly and submerge them in the simmering water until you are ready to fill them. Combine the pickling spices, vinegar, honey and salt in a large saucepan. Bring it to a simmer and let it cook for five minutes. Turn off the heat and let the brine cool slightly while you fill the jars. Remove the jars and lids from the simmering water using the jar lifter. Drain them upside down on clean kitchen towels. Cut the tomatoes in wedges with a knife. Pack the tomatoes into the canning jars and put three pepper halves, a bay leaf and two cloves of garlic in each jar. Pour the brine over the tomatoes, leaving 1/2-inch of space at the top of the jars. Put some of the pickling spices in each jar. Wipe the rims of the jars with a damp cloth. Put on the lids and hand-tighten the rings to hold the lids in place. Put the jars back into the simmering water in the canner. Add more boiling water if necessary to cover the jars by at least 1 inch. Bring the water to a boil, reduce the heat to medium or whatever will maintain a steady low boil. Boil the jars for 20 minutes. Remove the jars from the water with the jar lifter. Set them on clean towels away from drafts. Make sure the jars don't touch each other. Allow the jars to cool completely. Test the lids to make sure the jars sealed. If the center of the lid pops up and down when you press it, that jar didn't seal and should be stored in the refrigerator and used first. Use extremely clean utensils, equipment and towels to prevent contamination of your pickles. How Do I Blanch Green Peppers?